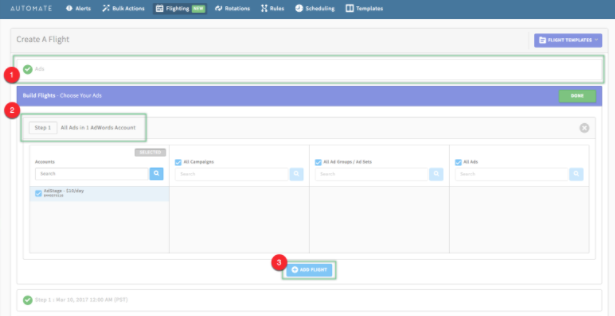 When a flight starts (based on the selected date/time), your first step of selected campaigns, ad groups, or ads will be activated. Once the first step of ads approaches its end date/time, those will be paused* and the next step will be enabled. This continues until there are no more steps (ex: ads) in your flight. *It's optional to have an end date for any flight. That said, you can have multiple flights active at one time. You are able to place an end date at any time while any step is currently in progress. What are some common ways to use Flighting? (1) Lead customers toward a higher conversion rate - By leading your audience through a specific sequence of ads you can increase CTR and conversion rate. Walk them through a marketing funnel from a brand awareness message (Step 1), product information stage (Step 2) and then have them convert or sign up (Step 3) with targeted CTA. (2) Progressive Promotions - If you have a promotion with different percentages off per week you can flight your ads to show accurately and timely. Easily set your first week ( step 1 - 10% off), second week (Step 2 - 20% off), third week (Step 3 - 30% off)...etc. How do I set up Flighting? 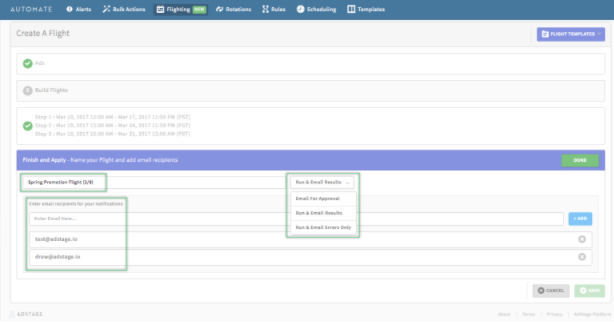 Navigate to Automate and select the Flighting task. 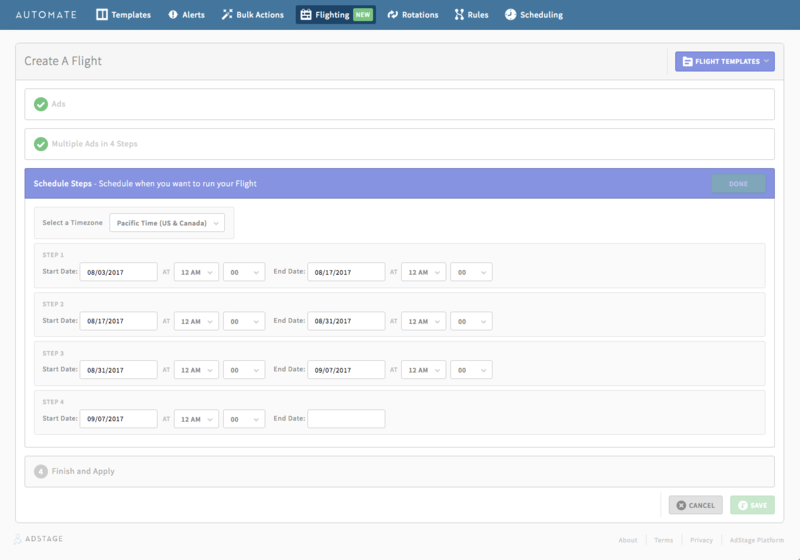 Step 1: Choose what you want to Flight: campaigns, ad groups/sets, or ads. Step 2: Select the network and the associated account, campaigns, ad groups/sets or ads to rotate. Example: 1 Flight with 3 Steps which will sequence 1 week apart. *Note* - The first step has to be set at least one hour ahead in the future. If not, you will not be allowed to move forward to the fifth step. Overlap your steps - To ensure that you always have a campaign, ad group or ad running, it's recommended that you overlap your step by an hour or two. Run indefinitely - If you would like for a step to run indefinitely, you can leave the end date blank, and your flight will continue. "Pending" status - This means your Flight has yet to run. It is probably scheduled for the future. Flighting won't alter the status of your entities simply by creating the Flight (unlike Rotations). It will only follow the instructions of your start dates and end dates. Remember to have the entities at the level selcted in step 1 paused before launching your Flight. Parent entities (campaign, ad set) must be active before the flight begins. 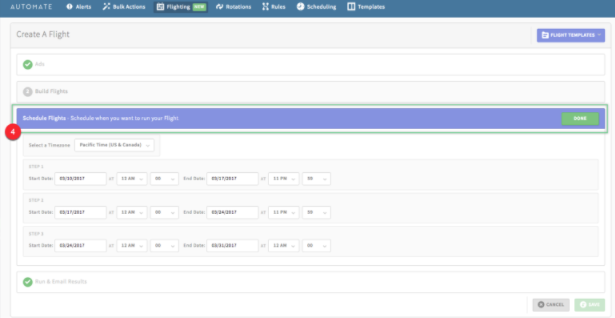 For example, if your flight is at the ad level, the ad set and campaign must be active. If your flight is at the ad set level, the campaign must be active, but the ad set must be paused before the flight begins. Need some help getting started? Check out our most frequently used Flights to get you started. Now that you're an expert, let's get started!